As the 2014 year comes to a close, there have been many essays in the media reflecting on the events of the past year. Also, as the first half of the academic year draws to a close, there have been many mailings, both in electronic and hardcopy form, of various newsletters. I have in the past several days received the Fall 2014 newsletter of the Transportation & Logistics Society of INFORMS, which is now online, the Analytics e-newsletter of INFORMS, the newsletter from the Department of Mathematics & Statistics at UMass Amherst, also online (a hardcopy I received via snail mail), as well as the Harvard Gazette newsletter, which is produced regularly in electronic format, and I enjoy very much. To view all the newsletters of the various schools and colleges at UMass Amherst, you can see the list on the Research Next website, on the bottom of this page. A searchable database of business research. Getting information out in a timely manner is critical in today's fast-paced business world and newsletters serve many important functions, including, for example, the dissemination of research results, accolades received, news items, upcoming conferences and events, and discussion of topics of interest. It takes time to produce a newsletter but constituents appreciate the efforts! I am sure that donors do as well! 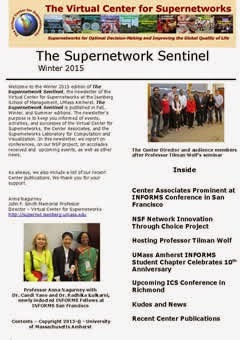 As The Director of the Virtual Center for Supernetworks at the Isenberg School of Management, I find that the center's newsletter. The Supernetwork Sentinel, also serves as a valuable medium through which we communicate what we do at the center. The newsletter is produced three times a year and it marks the progress that the Center Associates, which include faculty, industry leaders, as well as doctoral students, have made. Our most recent newsletter is the Winter 2015 edition. We've been producing this newsletter since the Fall of 2003 and all issues can be found here. I must say that it has been not only an amazing year, but amazing many years, as the newsletters clearly reveal. I always say that to do great work, it takes a great team, and the Supernetwork Team is the best! Yesterday I had the pleasure of being back in Cambridge, MA so I had to visit Brattle Street, Radcliffe, and Harvard Square. I have wonderful memories of that year -- of the people that I met, the friends that I made, and of the research and writing that I did. I lived on 83 Brattle Street in the building below on the 6th floor. My office was in Putnam House a few buildings down from my apartment, where, in the Fall that year, one of my neighbors was the French mathematician, Pierrette.Cassou-Nogues from Bourdeaux. In the Spring, my collaborator Professor Patrizia Daniele, who is an operations researcher, joined me for several months and Radcliffe provided her with an office in Putnam House, which was terrific! Patrizia is from the University of Catania in Italy and she is also a Supernetwork Center Associate. Below is a photo taken in front of Putnam House. Radcliffe Yard looked beautiful and I enjoyed checking out the award-winning sculpture. The sculpture is an installation called Saturate the Moment. We wandered over to Bartley's, a Cambridge institution but it was closed. Cardullo's in Harvard Square had the beautiful gingerbread house in its window below. Burdick's was open so we enjoyed some delicious hot chocolate! We had traveled to eastern MA, since my daughter wanted to meet a friend who had returned from a semester abroad at the University of St Andews in Scotland. The head (known as the Principal and Vice-Chancellor) of St Andrews is Dr. Louise Richardson, who was the Executive Dean of Radcliffe when I was there. You can see her at our Radcliffe Fellows "graduation" ceremony in the top photo in my blogpost here. You may recall that Prince William and his wife, Kate Middleton, the Duke and Dutchess of Cambridge (in England), were recently in NYC for a fundraiser for St Andrews, since they met at this university, and Dr. Richardson can be seen with them here. The 600th anniversary gala for the University of St Andrews took place at the Metropolitan Museum of Art. And, when I returned back to Amherst last night, I had a message from none other than Dr. Pierrette Cassou-Nogues, wishing me a Happy New Year! I heard from my great colleague and friend, Professor David E. Boyce, who forwarded me his holiday letter that the book that he has been immersed in writing, with Professor Huw Williams, Forecasting Urban Travel: Past Present and Future, is in the final stages of production with the publisher, Edward Elgar. On the book cover, featured above, are images of two of David's favorite cities, Chicago and Singapore. The book should be available for purchase in April 2015 from www.e-elgar.com/. Initially, it will be offered in hardcover and e-book formats. Within a year, according to David, a lower-priced paperback edition will then be issued. Finally, a Chinese translation is underway, which is quite exciting! According to a news item published in the TSL (Transportation Science and Logistics Society) of INFORMS Fall 2014 newsletter, which we received just last week: The book presents, in a non-mathematical way the evolution of methods, models and theories underpinning travel forecasts and policy analysis, from the urban transportation studies of the 1950s to current applications throughout the urbanized world. From original documents, correspondence and interviews, especially from the United States and the United Kingdom, the authors seek to capture the spirit and problems faced in different eras, as changing information requirements, computing technology and planning objectives conditioned the nature of forecasts. I have had the pleasure of seeing Chapter 7 of the book, which is on Transportation Network Equilibrium, which David asked me to provide feedback on, which was a pleasure to do, since it was like a trip down memory lane, during which I reminisced about the contributions of my doctoral dissertation advisor at Brown University, Professor Stella Dafermos, and her amazing contributions. It was also a pleasure to read and reflect on the work that we did jointly prior to her death. I am sure that this book will be a classic in transportation science as well as the history of travel forecasting and am very much looking forward to its publication in the spring of 2015. Chapter 7, alone, is worth the price of the book, since there is a very human aspect to the rendition of discoveries therein and the individuals involved. Yesterday, in traveling back from early holiday celebrations with relatives in Newport, Rhode Island, we stopped in Providence. I was curious to see how my alma mater, Brown University, was faring, given that I had heard that construction was in the plans. There is something very special about going back to the place where you received a great education, made many friends, and have lifelong memories. OK, I admit, I also met my husband there freshman week - he was a graduate student in physics. Thayer Street - the main commercial street that cuts through the campus is filled with even more restaurants than ever - quite a few with an international focus, which is great. Pembroke, pictured below, where I lived as a freshman, still looks good. As does Diman House, where I lived, and had the best room-mate, Teresa Davila, who was on the women's crew team - amazing for a former ballerina from Chile, and fellow Applied Math major. I loved living at Diman, because it was close to the "Ratty," the main cafeteria, as well as to the frat quad, which made life always interesting. Yes, in those days, we even got to see "streakers," including members of the football team. Also, I have incredibly fond memories of living in the Russian House and, even last summer, while visiting my daughter, who was doing research at the University of Colorado, Boulder, we got to see Dr. Mark Kiken, who received his PhD from Brown. He was the dorm resident assistant of Russian House when I lived there for a year. My other major (I hold an AB and an ScB from Brown) was Russian Language & Literature. I reconnected this past year with two other Russian majors, Janice Pilch, now at Rutgers, and Jill Rappaport, now teaching at Temple. We would spend a lot of time at Marston Hall where many of the language faculty had offices. I could not resist having the photo taken below in front of Marston. Then, just a few feet away, is the beautiful Applied Math building with stained glass windows, where I would visit faculty during office hours and we would pick up our exams and homeworks. Less than a decade after getting my PhD from Brown in Applied Math, with a specialization in Operations Research, I was back in that building on my sabbatical and there I wrote my first book, Network Economics: A Variational Inequality Approach. I lived then in an apartment complex known as Wayland Manor, on Wayland Square, which I visited yesterday. My apartment was on the first floor behind the trees in the photo above. Walking through the main campus was nostalgic. Brown had invited me back (the Mathe Department) in 2007 to speak at the SUMS conference on Operations Research to undergraduates and a clip of my talk was posted on youtube. And, speaking of fellow Brown University Applied Math majors, I just heard that (I was his TA in OR courses), Dr. Irv Lustig has left IBM! Dr. Les Servi of Mitre, another fellow Brown Applied Math major, is also rrenowned in our INFORMS professional community. And, of course, I have to mention Dr. Georgia Perakis of the Sloan School at MIT. Georgia was my dissertation advisor's 4th PhD student and I was her first. And, while on the main campus green, I had to take a photo of Wilson Hall, where I had my calculus classes from one of the founder's of dynamical systems, Professor Joe LaSalle. The campus was very quiet since it is now the winter break period. After exploring Brown, it was time to head to the Italian section of Providence, on Atwell's Avenue, to see what kind of holiday pastries were on display. I couldn't resist taking the photo of the tree below - note that instead of a double yellow line on the street, there is a long Italian flag painted. With best wishes for a joyous holiday season to my readers! Now is the time of the holiday season that freight carriers are extremely busy, with Christmas only 3 days away and with the memories of the delivery delays of Christmas 2013 still fresh. In an article in today's New York Times, "Crunch Time for FedEx and UPS as Last-Minute Holiday Shipping Ramps Up," Hiroki Tabuchi writes that "UPS announced that it was hiring up to 95,000 seasonal workers, more than twice the number it employed last year. FedEx said it had hired 50,000 workers for the holidays. And both say they have invested heavily in infrastructure." The planning for this year reads like a large-scale military logistical operation with, according to the article, FedEx saying that it has strengthened its contingency planning, after shippers were summarily slammed for delivery delays last holiday season. Last year's delays were attributed to bad weather as well as a surge in online shopping after Thanksgiving. Last year's delivery debacles inspired us to work on time-based supply chain network competition and the outcome was the paper, Supply Chain Network Competition in Time-Sensitive Markets, Anna Nagurney, Min Yu, Jonas Floden, and Ladimer S. Nagurney, which was published in Transportation Research E 70: (2014) pp 112-127. In the paper, we discuss that delays in holiday freight deliveries are not solely a US phenomenon but even happen in Sweden! We also highlight the use of alternative modes, notably, air freight, as was used to speedup deliveries of paraphernalia prroduced in China and associated with the Disney movie Frozen because of the immense demand in clothing and other gear. I can attest to this since one of my nieces had a full-fledged Frozen birthday party for her 7th birthday, complete with the Princesses Elsa and Anna making appearances! According to the Times article, UPS also pressed retailers early for forecasts with its volume forecasting for this holiday season beginning as soon as its handlers got through last year’s chaos. A company that did not forecast the demand for one of its products, is the iconic retailer, L.L. Bean of Maine. The demand for its boots has been astronomical (my daughter is one of the disappointed customers) with a backorder of 600,000 units (she hopes to get her pair sometime in February, way after Christmas). NPR had a nice segment on this topic and even noted the great Lafayette College vs. Lehigh U. 150th football rivalry game at Yankee Stadium that I was at and blogged about. L.L. Bean sent us a letter explaining the situation with a gift of a boot keychain, which is now hanging on our tree. Freight services are a critical component of effective and efficient supply chains and, oftentimes, they are taken for granted. During the holiday season they are challenged to the max. Since I love logistics and care about not only the quality of products but also the quality of freight service provision, out latest paper is on precisely that topic: Supply Chain Network Competition in Price and Quality with Multiple Manufacturers and Freight Service Providers, Anna Nagurney, Sara Saberi, Shivani Shukla, and Jonas Floden. Happy Holidays, everyone, and may your packages arrive in time and in good shape! Honoring Women in STEM. 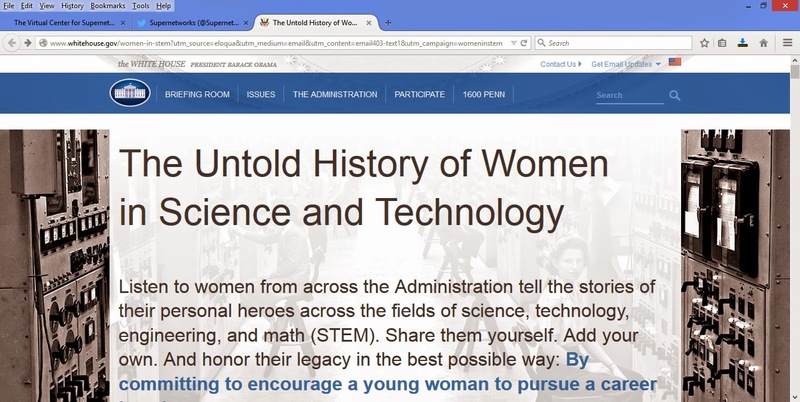 The White House has posted a website with audio stories about women in science, technology, engineering, or math (STEM) who have contributed to critical advancements in their field. The Administration is encouraging others to submit their own stories of women in STEM who have inspired them (e.g., school teacher) to pursue a STEM degree and/or who have contributed to S&T advancements. Go here to submit your story. After submitting the grades for my students in my class, I decided to check out the website. I listened to a number of the podcasts, which are nicely done, several of which are by the new Chief Technology Officer, Megan Smith. I then proceeded to add to the stories, and wrote about my doctoral dissertation advisor at Brown University, Professor Stella Dafermos. I also added my experiences. Then it was time to press the blue Commit button at the bottom of the above page. And what I got is the page below. 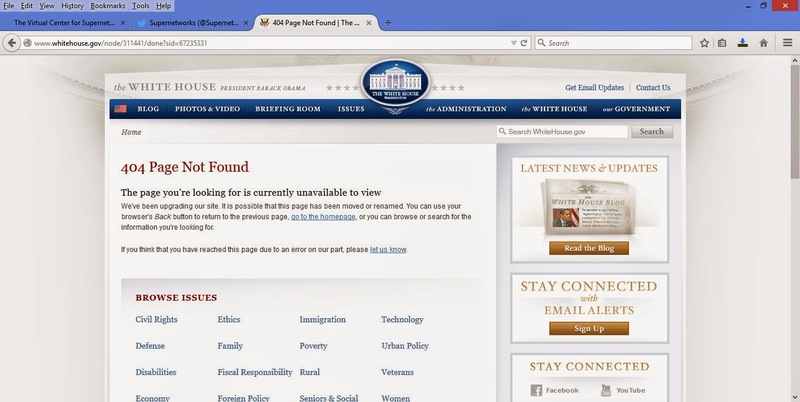 I tweeted to to Megan Smith and also to the White House and tried over several days to submit, hoping that maybe the website problem had been fixed - to no avail. 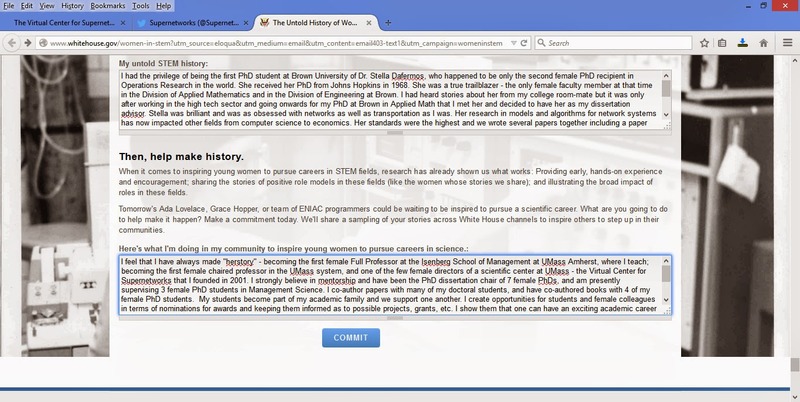 Mr. President and Madame CTO, the stories of Women in STEM will remain Untold, unless you fix the website! I am getting feelings of deja vu - ironic - of healthcare.gov. Terrific Operations + Analytics Conferences in 2015 + More! I am very much looking forward to the New 2015 Year! The Spring 2015 semester I will be teaching two of my favorite courses at the Isenberg School and the Supernetwork Center Associates and I will be taking part in many conferences. Shortly after the 1st of the New Year, there will be the 2015 INFORMS Computing Society Conference in Richmond, VA, January 11-13, at which we will be presenting our latest work on our NSF Future Internet Architecture project. The title of our paper is: A Game Theory Model for a Differentiated Service-Oriented Internet with Duration-Based Contracts, Anna Nagurney, Sara Saberi, Tilman Wolf, and Ladimer S. Nagurney. The paper will be published in the Proceedings of ICS 2015. Sara is one of my doctoral students who is also a 2014 Isenberg Scholar. Then, on February 7, 2015 (no travel needed for us for this one for us), the second Women of Isenberg Conference will take place at, of course, the Isenberg School of Management! I have been asked to speak on the Building Your Brand panel. This should be very engaging and fun and no power point is needed! Last year I enjoyed the inaugural Women of Isenberg conference very much and blogged about it. It was extra special to see one of my former undergrads and Supernetwork Center Associates, Christina Calvaneso there. Christina was funded, in part, under one of my NSF Research Experiences for Undergraduates (REU) grants. Later in February I will be going to a conference in Florida: World Congress on Global Optimization: WCGO 2015, Gainesville, FL, February 22-25. There I will present work with one of my doctoral students, Dong "Michelle" Li:: Supply Chain Performance Assessment and Supplier and Component Importance Identification in a General Competitive Multitiered Supply Chain Network Model. By that time I suspect, given last year's fierce winter in New England, I will need to see some greenery and experience some warmer temps! In March, 2015, to coincide with my Spring Break, I will have the pleasure of speaking in Berlin, Germany. Last summer I was an invited speaker at a workshop in Erice, Sicily on energy, and a member of the audience liked my presentation so the good word spread. I will be speaking in Berlin on "Sustainable Supply Chains for Sustainable Cities." The conference should be very interesting. It is on Φ·SOE Fachverband Physik sozio-ökonomischer Systeme (Physics of Socio-Economic Systems Division), German Physical Society, March 15-20. So nice to see my name on the elegant conference flier! Danke schon! In April, 2015, it will be time for the INFORMS Conference on Business Analytics and Operations Research, Huntington Beach, CA, April 12-14. I had such a marvelous time last year at the Boston Analytics conference, at which I spoke on Cybersecurity and Financial Services, that I had to submit a proposal to speak in CA. We'll see if the proposal is successful! Center Associates Professor Jose Cruz of UConn and Professor Zugang "Leo" Liu of Penn State Hazleton will both be going to this conference. In early May, to coincide, inconveniently, as also happened last year, with our UMass graduations, the POMS conference will take place in DC. All of my doctoral students and I have submitted papers for presentation there and I have another one submitted with a former student who is a Center Associate, Dr. Min Yu of the University of Portland. Kalamata, Greece, June 29-July 2, 2015, which should be outstanding (but I am a bit biased, I must say). The Organizing Committee consists of academics and practitioners from around the globe.In Spring 2015 I am again teaching my course, Humanitarian Logistics and Healthcare, so the conference will be very synergistic. Then it will be time for the EURO XXVII Annual Conference, Glasgow, Scotland, July 12-15, My great colleague and Supernetwork Center Associate, Professor Patrizia Daniele, invited me to speak in her session, which will also have Professor Tyrrell Rockafellar as a speaker. He is renowned for his work in optimization! 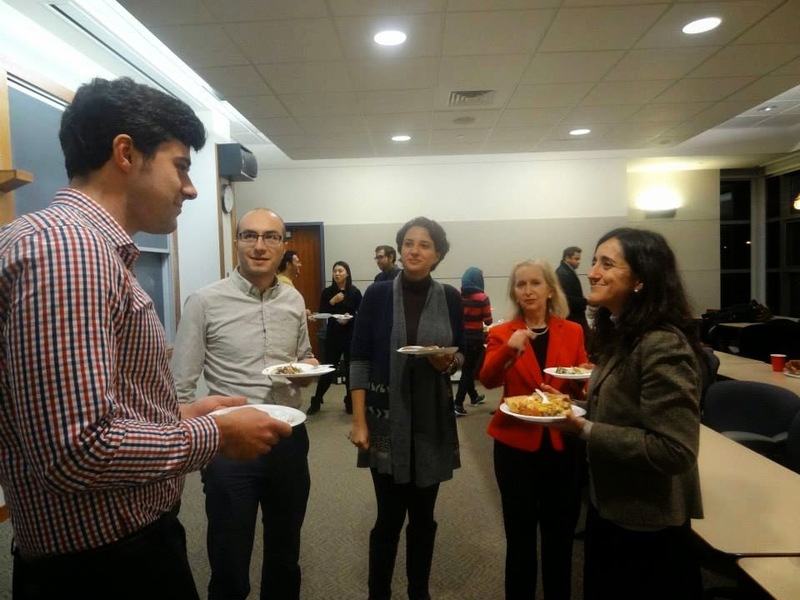 Faculty and even doctoral students are jet-setters but conferences are extremely important venues for knowledge exchange and, of course, networking! Plus, one's institution gains from the enhanced visivility! INFORMS has a great new communications social networking platform for its members called INFORMS Connect and today I enjoyed the question posed by Barry List, the Communications Director of INFORMS, to Glenn Wegryn, the President of the INFORMS Analytics Section. Specifically, Barry asked Glenn what are the top 5 analytics predictions for 2015? I found Glenn's answers thought-provoking and terrific so I have reprised them below along with some commentary. The comments are timely since, just yesterday, we had our end of the semester faculty and staff meeting at the Isenberg School Management at which the strategic plan drafts, primarily from an undergrad perspective, were presented by each of the 7 departments. Clear themes emerged, based on input from industry, as to how we can be a "Destination of Choice." The top theme and focus, based on presentations given by several of the department chairs was that of Analytics. 2014 proved to be a winning year for analytics. Going by the number of conferences devoted to the topic of analytics and attendance, including this year's record-breaking INFORMS Annual Conference in San Francisco, all indications are that it will continue to prosper. Here I present five of the most important predictions regarding analytics capabilities for 2015. #1 What's in a name? There will be continued effort, albeit not fully resolved in 2015, to converge on a common definition of what analytics is. INFORMS' official definition is "...the scientific process of transforming data into insight for making better decisions." There are numerous other definitions or positions on what analytics is, but a middle ground needs to be found between the data-centric definition of analytics (What can the data tell us?) and the decision-centric version (What is the problem we're trying to solve?). Indeed, I view analytics as a bridge to converge the two in peaceful co-existence. Most importantly, it provides an easier point of entry for decision-makers to embrace, organize around, pay for, and ultimately benefit from all of the tools in the shed. The more we play in the same sandbox, the bigger the castle we can build together. Glenn makes an excellent point here. Several of the departments, from my own, the Operations & Information Management Department, to Sports Management, to Marketing, as well as Hospitality and Information Management, noted the importance of analytics in the curriculum as well as in our MBA program. However, there are clearly different perspectives. I would expect that some of the primary tool-based courses would be taught by my department since that is where the expertise lies in terms of stats, optimization, modeling, and even on a wide spectrum of applications, etc. What is critical to emphasize is that analytics is not just about the past and forecasting the future but, as Glenn said, it is about making decisions, and I emphasize better decisions, whether it is in profit or nonprofit organizations, government, or even in your personal life! #2 Business Analytics programs will continue to grow. There are now over 100 business schools in the U.S. that have, or have committed to launch, curriculum at the undergraduate and graduate levels with degrees or certificates in Business Analytics . No doubt there will be more in 2015. Clearly the B-Schools have heard the call from McKinsey  and others  on the significant gap projected between the supply and demand for talent in the analytics space, particularly in the predict-and-decide advanced analytics skills. In 2015, the more established programs will dig deeper and continue to fine tune the curriculum while newer programs will close the gap quickly. The more successful programs will leverage the breadth of academic disciplines (computer science, operations research, engineering, math and statistics, marketing, finance, and others) to strengthen their programs. We are on board with you, Glenn! An excellent example of a very successful program is at the School of Business at UConn, which is headed by my former PhD student at the Isenberg School, Dr. Jose M. Cruz. Jose is the Director of the Master's program in Business Analytics and Project Management. With Jose's degrees in computer systems engineering, math, plus an MBA with a concentration in Finance, and a PhD in Management Science, he is interdisciplinary in one body! I am very pleased that one of my former undergrads, Emily Covill, is now pursuing a Master's at NCState in analytics with a dream of working in sports analytics! #3 Fraud and Security. With the number of security breaches on major corporations being reported almost weekly, such as at Target, The Home Depot and more recently at Sony Pictures, there will be a significant increase in investment across the board in safeguarding commerce and privacy on the Internet. The importance of applying analytics methods - from using decision analysis to guide investment choices, to statistical methods, to detect-and-anticipate breaches and optimization models, to improve infrastructure design for safety, reliability and performance - will accelerate and continue to grow in 2015. Thanks for making this point, Glenn! We have benefited from 2 grants received from the Advanced Cyber Security Center (ACSC) and are continuing to research such issues. Last year, I had a fabulous time at the Boston Analytics conference and spoke on Cybersecurity and Financial Services. Some of my latest research on the topic is in the paper, A Multiproduct Network Economic Model of Cybercrime in Financial Services. #4 Collaboration and Communication (aka the soft skills) will emerge as the difference-maker not only in getting the best talent hired into the most coveted roles, but also in enabling more recognition and value to organizations that utilize analytics. Soft skills are important to educate, sell the value of, and, ultimately transform the culture within departments and organizations. But more importantly, these soft skills are essential to clearly convey the context of the problem and to recommend a course of action for a decision-maker to take. That can span from intelligent bots interacting effectively with users in an on-line application, to independent practitioners seeking to build repeat business with a client, to boardroom analysts able to think on their feet and able to describe in plain language the options available and facilitate a decision. Communication includes effective use of visual capabilities from Tufte-proud graphics to interactive, data-rich, drill-down tools as a means, and not an end, to a better decision. Several of the department chairs yesterday emphasized the need for more opportunities for students to enhance their communication skills, including, through additional writing and experiences. Our students have many student clubs that they engage in and do community service, all forums for building additional communication skills. Plus, several departments, including my own, have student groups taking part in a variety of regional case competitions with excellent results. #5 The INFORMS Certified Analytics Professional (CAP) Program will continue to increase in importance as a qualification of skills and experience. Longer term, as the supply of analytic talent catches up to demand, the CAP program will be recognized as an important differentiator for employment. Currently, the number who are either currently certified or are signed up to take the exam exceeds the rate of the Project Management Professional (PMP) certification, over the same period . To that end, INFORMS should begin a campaign targeted to the "buyer" of analytics to grow awareness of this certification in their hiring decisions. This is a marvelous initiative on INFORMS' part and for professional communities - thanks for all the hard work! Research from INFORMS Masters in Analytics Committee, presented at the 2014 INFORMS Annual Meeting (link). Getting Great News While on the Train - You are a Fellow! When one gets some very good news (or bad), one remembers that very moment - from what you were doing when you heard the news to where you were when you received it. Nowadays, much good news comes via email and, with smartphones, the messages can be received almost anywhere. While on a recent trip to NYC, via the MetroNorth train from New Haven, I was engrossed in my New York Times and enjoying the journey. I love riding trains. My husband reached for my smartphone and decided to check my email and said, "You have a message from Oxford University." I suspected that this was a decision on my application to be a Visiting Fellow at Oxford, a dream I had harbored for a while. And indeed, it was! The message said that a letter inviting me to take up a Visiting Fellowship had been posted and the sender stated that "I take great pleasure in attaching a pdf copy." The letter, a hardcopy of which I also subsequently received via Royal Mail, stated that I had been offered the fellowship for the 2015-2016 year for the trinity term, which is the term that I had requested. I will be a Fellow at All Souls College at Oxford and will be researching supply chains and quality, a topic that I a very passionate about since it impacts so many products that affect consumers from pharmaceuticals and food to high tech and durable products. Almost every day, one reads about quality failures of suppliers, some with devastating effects on human lives. According to the letter, I will be provided with a workroom in the college, will have free accommodation at Oxford, and will have meals at Common Table (yes, capitalized). The atmosphere and support will be incredible. One can become a Fellow of a professional society (for example, I was so honored to become a Fellow of INFORMS and also RSAI). One can also be a Visiting Fellow, as at Oxford, and other universities that have such programs, as well as at Institutes. For example, in 2005-2006 I was a Science Fellow at the Radcliffe Institute for Advanced Study at Harvard University, one of the best experiences that I have ever had, and where I wrote my Supply Chain Network Economics book. I am so honored to have this great opportunity at one of the greatest universities in the world! And, amazingly, On December 4, 2014, at our wonderful tribute to Gene Isenberg, after whom our School of Management at UMass Amherst is named, I had the pleasure of speaking with one of the grandsons, Stefan, who had recently graduated from Oxford! He told me about the unique place that All Souls College has at Oxford and its exceptional library. I know that I will be inspired tremendously and will do my utmost to contribute to research and the life of the college while I am there and afterwards. Also, Stefan told me that he has appeared in several recent episodes of the PBS Masterpiece Mystery Inspector Lewis series (a followup on the Inspector Morse series), which takes place in Oxford, with many of the characters affiliated (fictionally) with Oxford University, I became captivated by this program while being a Visiting Professor in Gothenburg (the Swedes show a lot of British TV programs). A list of the Visiting Fellows this year is comprised of an economist, lawyers, literature scholars, and an astronomer, to start, with renowned universities such as Harvard and Stanford represented. I thrive in interdisciplinary settings such as Radcliffe, so am so looking forward to experiences that I know will be truly special. This morning I gave the final exam to my Logistics & Transportation students and also collected their project papers, which I am enjoying reading very much. The field of Logistics & Transportation has so many great applications! And, since this is the holiday season, it is a perfect time for putting Operations Research into practice by executing my holiday cookie supply chain. I must admit, since my students have been so good this semester, I spoiled them today. The exam was at 8AM so they needed some support. I brought in the holiday cookies below, which I baked last night after a day filled with meetings. Several of the students used the "carrot" of a cookie as a reward for finishing the exam whereas some indulged even before. The raspberry filled cookies above are Swedish cookies from a recipe that my wonderful Office Manager at the School of Business, Economics and Law at the University of Gothenburg provided me with (and she even gave me a plate of them that she had baked about a year ago - so special)! A holiday cookie supply chain just may be the most delicious one - I had to, first, procure the ingredients: the flour, sugar, confectioner's sugar, vanilla, eggs, plus marzipan, almond paste, candied cherries, M&Ms for decorating (the mitten cookies above), pecans, rum, walnuts, coconut, chocolate, corn syrup, maraschino cherries, and raspberry jam. These are the major ingredients of my holiday cookie supply chain this year. And, of course, you need parchment paper (a savior for professional bakers as well as me since it saves the cookies and reduces cleaning time), wax paper (for rolling out nicely the shaped cookies), cookie baking trays, a rolling pin, cookie cutters, and nice plates, wrapping paper, and ribbons for the deliveries. When we research and teach about product supply chains I always emphasize the production processes and I have felt like a cookie manufacturer lately. The production process is very much an assembly line process but there are tasks that one does simultaneously - for example, while batches are baking, I am preparing the next batch. Since many cookies bake quite quickly - such as the ones pictured above (about 13 minutes), one can do the processing quite efficiently. Plus, rum balls don't need to be baked and are favorites among our neighbors! Then there is the cooling, and, in the case of my famous rum balls, it is actually best if they are stored for a few days - so storage is another important activity. Below are some of the cookies that I have baked this holiday season - all gone! Packaging is another enjoyable aspect of processing holiday cookies. And, of course, distribution is what gets the cookies delivered to the consumers! In my case, so far this year, there have been many deliveries - to our wonderful neighbors, to the UMass Amherst INFORMS Student Chapter members and guests at our party last Friday, and to my students today! Plus, rather than just local deliveries, we have also made some shipments through mail. There is nothing like putting Operations Research into practice for the enjoyment of many! Besides, what is better than playing with dough and decorating cookies during a time in the academic calendar that is quite hectic! Now is that special time of the year when surprise packages arrive at your door! Along with this note you'll find a copy of the first book published on the Physical Internet (The Physical Internet: The Network of Logistics Networks). There were only 100 published - so, hang onto this collector's item! The image of the book is above and it is co-authored by Eric Ballot, Benoit Montreuil, and Russel D. Meller. I felt very special getting a copy and expressed by appreciation in a Thank You message to Russ! I have almost finished reading the book, which I am enjoying very much. It is a glossy production, not surprising, since it was published in beautiful Paris. There are numerous figures, networks images, bar charts, and tables. The basic premise is that "Like the Digital Internet that conveys data, the concept is to connect and synchronize all logistics networks to create a collaborative and robust physical network of networks, capable of continually optimizing the shipment of "encapsulated" goods of many times and sizes." Performance indicators are provided, including the impact on environmental emissions and the optimization of both the operator's and customer's economic models. There are also mini case studies throughout. When I read "network of networks" I immediately thought of Supernetworks! And, coincidentally, our supernetwork research group has been, for over a decade, contributing to the vast literature on supply chains with a focus on the network aspects. Also, for the past 3 years we have been working on ChoiceNet, an NSF-funded multiuniversity project to develop an economy plane for the Internet. In fact, my collaborator, Professor Tilman Wolf, spoke on our project just this past Friday in our INFORMS Speaker Series. Interestingly, in contrast to what the authors of the new book emphasize, we are doing the converse. We are bringing ideas from supply chain networks to the Future Internet Architecture(s) using network theory, game theory, variational inequality theory as well as projected dynamical systems theory. The work is multidisciplinary, as it should be, since knowledge about engineering, computer science, economics and operations research/management science are needed to explore all the relevant issues. It is very exciting to see the commonalities being bridged from a supernetwork perspective! For some background on the foundation of the Physical Internet, see the paper by the book's co-authors. It seems to be a truism that the busiest people also get the most done! This past Friday was the last day of classes at UMass Amherst for the Fall 2014 semester with final exams beginning this week. There are final exams to study for and papers to complete so students are especially busy now as are the faculty. 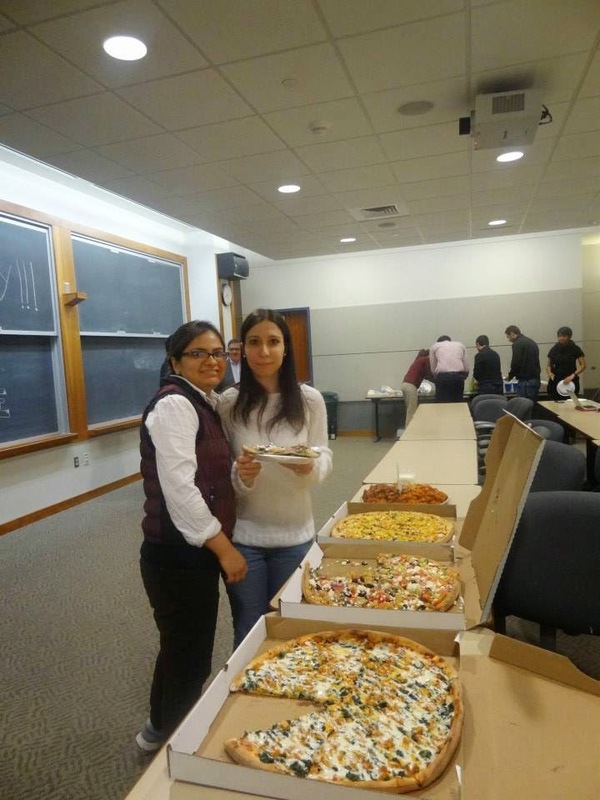 But great memories are made of special experiences and it has been the tradition of the UMass Amherst INFORMS Student Chapter to always host an end of the semester party. 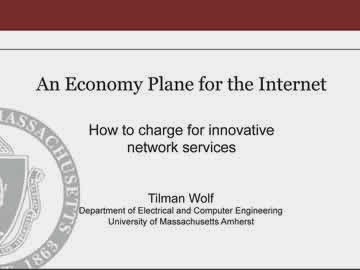 This we did (I am the Faculty Advisor of the chapter) on Friday, after also hosting Professor Tilman Wolf in our Speaker Series, who gave a brilliant talk: An Economy Plane for the Internet : Paying for Innovative Network Services that I blogged about. Clearly, there were some logistical challenges with the talk and discussions over closer to 3:30PM and with the party beginning in the same room at the Isenberg School of Management at 4:30PM. But, with students taking courses in Network Optimization, Logistics & Transportation, and Supply Chains, to start, they were definitely up to the challenge! Special thanks to Michael Prokle, Chapter President, and Sara Saberi, Chapter Treasurer, for their extraordinary work on both events on Friday and to Heng Chen, Chapter Secretary, for disseminating the news, along with Pritha Dutta, Communications Director! Please visit the UMass Amherst INFORMS Student Chapter site for more photos and information. Kudos to our terrific Webmaster, Ekin Koker! Our parties are not to be missed - the cuisine is always international. This time in addition to the varenyky (pierogies) and kielbasy that I brought, along with cookies that I baked, we had Asian food, Middle Eastern food, veggie salads, and, of course, pizza with different toppings. We also had delicious cakes, fruit salad, and many different juices and drinks. The Chapter Officers did a great job of allocating the tasks, doing the budgeting, picking up the food (and it was a very cold day so we needed to keep the hot food warm for all the guests). The party began at 4:30 PM and we closed up around 7PM. The conversations were fabulous and faculty and students from the Isenberg School of Management and the College of Engineering took part with a focus (note the name of the chapter) on those in Operations research and the Management Sciences. It was special to even have several staff members from the Isenberg School attend. This was a great event in which to catch up, wish everyone good luck for the exams, and a Happy Holiday Season! Events such as these build communities and I congratulate the hard-working students and chapter officers for doing such a great job. 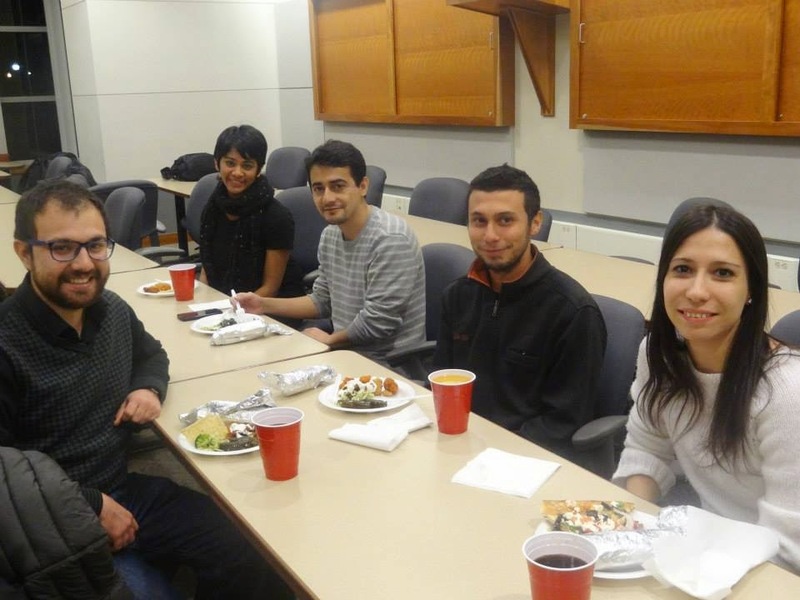 This week was the last week of the Fall 2014 Fall semester and yesterday we hosted two great events: a seminar by Professor Tilman Wolf, who flew back from a conference in Paris (he had left on Monday afternoon) to speak in our UMass Amherst INFORMS Speaker Series followed by, shortly thereafter, our end of the semester party! Professor Wolf is an Associate Dean at the College of Engineering at UMass Amherst and is a Professor in its Department of Computer and Electrical Engineering. He has received many awards for his research on networking. I first treated Professor Wolf, along with a group of doctoral students, to lunch at the University Club, and we had such a great time talking and laughing that we were late for the reception prior to his talk, which began at 2PM. Tilman is the PI on our big NSF Future Internet Architecture project: Network Innovation Through Choice, that I am a Co-PI on and that two of my doctoral students, Sara Saberi and Dong "Michelle" Li, have received support from. We were all very much looking forward to his talk, "An Economy Plane for the Internet." Frankly, since I have hosted probably about 100 speakers in the series that the students of the UMass Amherst INFORMS Student Chapter help me to organize, I was a bit worried that he might not make it back in time from Europe so it was a big relief when I reached him yesterday morning. 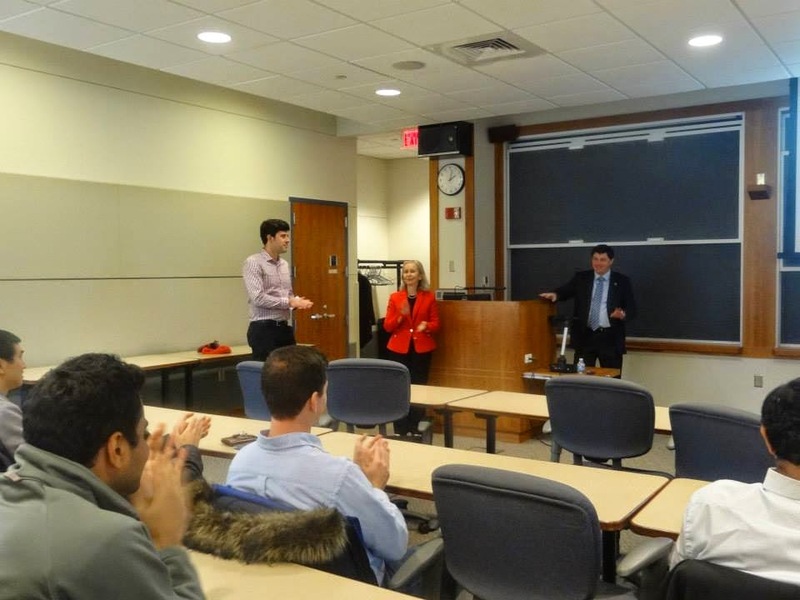 His presentation attracted faculty, staff, as well as students from both the Isenberg School of Management and the College of Engineering as well as from the Office of Information Technologies at UMass. We had advertised the talk widely through our e-lists, the Isenberg School website as well as the UMass Amherst events webpage. His talk provided an outstanding motivation and overview of why ChoiceNet, which is the architecture that we are developing, will lead to greater innovation of the Internet in terms of network services. He presented multicasting and why multicasting has not been as successful as had been originally theorized that it would be. He described the principles of ChoiceNet, which I have blogged about. It was thrilling for the doctoral students who have worked with us to see their papers and names in his presentation! He emphasized how ChoiceNet would offer more choices in terms of duration-based contracts and even, if desired by consumers, enhanced cybersecurity, which I am also very interested in. His presentation generated many excellent questions, always the signature of a great talk! He has kindly provided us with his presentation, which has been posted here. We thank Professor Wolf for taking time out of his exceptionally busy schedule for giving us such an outstanding seminar presentation! Today, we had the honor and privilege of taking part in a tribute to Mr. Gene M. Isenberg after whom our School of Management is named because of the immense gift that he gave in the late 1990s. Mr. Isenberg passed away in March 2014. I have posted the program below, which included remarks from both our present Dean, Dr. Mark Fuller, our former Dean, Dr. Tom O'Brien, who was instrumental in securing the financial gift, as well as our present Chancellor, Dr. Kumble Subbaswamy, and our former Chancellor, Dr. John Lombardi. Dean Fuller spoke about being the first in his family to go to college and how Isenberg valued resilience, persistence, and tenacity, which are characteristics of our students, many of whom are also first generation college students. In addition, he emphasized our students' exemplary work ethic. Dr. O'Brien provided a vivid historical perspective on how the philanthropy of the Isenberg family has stimulated others to give to the Isenberg School and UMass Amherst. Our beautiful building addition, constructed during Dean O'Brien's twenty year period as Dean, with high technology classrooms, breakout rooms, new offices, and the atrium provide an environment in which we can collaborate and work together. Dr.. Lombardi's speech was rousing and energizing and I could hear echoes of "Go UMass!" over the years that he served as our outstanding Chancellor. Chancellor Subbaswamy was gracious and his speech was warm and heartfelt. It was wonderful to see everyone stay for the reception that followed. In addition, we had the pleasure of hearing very moving speeches as to the impact of the Isenbergs' philanthropy on education, from a present doctoral student at UMass, Sandra Roy, who has formed her biopharma company, as well as from an Isenberg alum, Brian Tino. By video, Anthony Petrello, Chairman of the Board and CEO of Nabors Industries, also spoke.and emphasized the leadership of Mr. Isenberg throughout his 25 years at Nabors Industries and how he turned the company around as its CEO and Chairman of the Board. He noted how much Isenberg valued the importance of people and the team in addition to the work ethic for success. Isenberg's advice on success was commented on several times - including to make sure that you do what you love, which I completely agree with. The Isenberg School also showed a video in which several administrators paid tribute along with several students and Mrs. Ronnie Isenberg reflected on the amazing man that her husband was. In the audience, were: Mrs. Ronnie Isenberg, her daughter, Dina and husband, and their three children who live in Wales (yes, across the Atlantic Ocean), along with many invited guests, faculty, staff, and students. The Isenberg grandchildren spoke lovingly of their grandfather who liked to be called "papa." I had the most enjoyable conversation at the reception in our atrium afterwards, with Stefan, one of the two grandsons. He had recently graduated from Oxford University in England and I marveled at my luck and serendipity because, just a short while ago, I was informed that I was selected to be a Fellow at Oxford for a term for next year! And, yes, Stefan has even appeared (in the background) in several PBS Inspector Morse episodes, which are filmed in Oxford. His brother and sister are studying medicine in England in Southampton and Birmingham. It was very special to be able to speak to Mrs. Ronnie Isenberg and to reminisce about Gene. There was a red carpet leading to the Flavin Auditorium where the tribute took place and both our atrium and the walkway with the carpet were decorated with beautiful plants. Below are photos that I took at the reception today. I have written on several occasions about the Isenbergs on this blog and the impact that they have had on our school, on UMass Amherst, and on our students. Gene truly valued education and the difference that education can make in the lives of people. He also astutely recognized the importance of synergies among business, science, and engineering, a model that I love. He endowed 3 chaired professorships and numerous scholarships at UMass Amherst. One of my doctoral students, Sara Saberi, this year became an Isenberg Scholar. She is with me in the photo below. I also very fondly remember Mr. Gene Isenberg's sense of humor. And as Dr. Lombardi said he did not suffer fools gladly. The Isenbergs were married for 62 years and their legacy is treendous.